Microsoft introduced new Nano Server with Windows Server 2016. A deeply refactored version of Windows Server, designed to give you the lightest and fastest server OS configuration with fewer patch and updates, faster restarts, better resource utilization and tighter security. Microsoft have removed GUI, Winlogon, Remote Desktop, Win 32 libraries from Nano Server to make it slim. Namo server is at least 25 times smaller than Windows Server 2016. It is good to see Microsoft finally doing what Linux doing for years. Nano Server support Software repositories, that allow you to install software. You can add public ally available repositories or create your own repository with custom software for your needs. With popularity of container based technology like Docker, Kubernetes, OpenShift, CoreOS etc, Nano server is very important for windows to be part of cloud infrastructure that demands high density and efficient resource utilization. All management is done remotely via PowerShell and WMI. Nano server also come with a new web-based remote management tool. 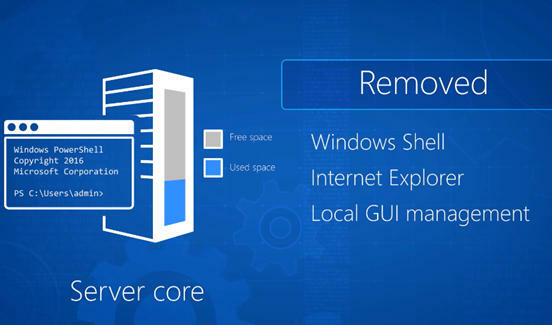 Local access is provided by Nano Server Recovery Console, which gives you a local interface with lightweight UI.